Safety regulators say they can find no evidence of brake hose defects in 2015 police SUVs. 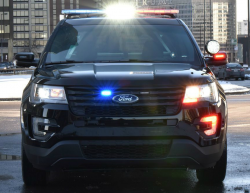 November 9, 2018 — A Ford Explorer Police Interceptor brake hose investigation has been closed by the government after investigators determined more than 20,000 model year 2015 SUVs are safe to drive. It took the National Highway Traffic Safety Administration (NHTSA) more than three years to finally make its decision after the Sacramento Police Department reported their Explorers experienced brake hose problems during driver training. The original investigation was opened in 2015 and later upgraded after the Sacramento PD said brake hoses failed at the caliper ends where the hoses attached to the end fittings. All the incidents occurred during driver training on a closed track and caused the Police Interceptors to lose their front brakes after the brake fluid leaked. NHTSA says it looked at the maximum brake hose caliper crimp temperatures under various conditions and searched for signs of degradation from heat. Additionally, safety regulators searched complaint data looking for other reports about the Explorer police SUVs. Based on tests conducted on the SUVs, the brake hose components may suffer from heat damage, but only on Explorer Police Interceptors used by Sacramento. In closing the investigation without any further action, NHTSA says it didn't confirm any similar brake hose caliper crimp failures in 2015 Explorers that weren't used for the Sacramento PD training. Safety investigators say they will continue to monitor any related reports, but for now the evidence shows the brake hose failures are unique to the driver training offered by Sacramento police. Ford Explorer police SUVs have been the focus of a federal brake hose investigation before, but NHTSA also closed that investigation into 2013 Explorer Interceptors. Safety regulators said they couldn't find any defects in the hose assemblies even though 13 complaints had been filed from one police department. Ford told the government the brake hoses leaked fluid because repair procedures had damaged the hoses. CarComplaints.com has owner-reported complaints about Ford Explorer SUVs.